This winter we unveiled our new points, levels and badges for reviewers; but did you also know that you have a new profile to design and customise? Here are all the new features you’ll find to give your Euan’s Guide profile a new look for 2017! Where do I find my profile? To find your profile on Euan’s Guide, you’ll first need to register or log in. You can do this on the homepage. Once logged in, you will see ‘My Profile’ at the very top. Click on this to go to your corner of Euan’s Guide! Here you will find all of the reviews you’ve written and any badges you have collected. You’ll also see what level you’re currently on, and the fun part - you’ll be able to customise your profile! Once you’re logged in and on your profile page, you will notice a yellow button on the right-hand side which says ‘Edit Profile’. Click on this to be taken to your profile dashboard where you can start customising and making it ‘you’! If you want to add a profile photo, you can do so under ‘Your Details’ when editing your profile. Choose a picture that represents you! Profile pictures are 200 x 200 pixels in size. Your banner photo is a great way to show off a bit of your personality! If you’re a good photographer, you could show off one of your best shots. Or why not share a photo of your favourite place? Banner photos need to be at least 1024 x 220 pixels, and a maximum of 1440 x 220 pixels. If there’s a charity that you work closely with or just really want to shout about, this is the place to do it! Search for the charities you love by typing in the box next to ‘I Support…’ when editing your profile. If you can’t find what you’re looking for, send us an email and we’ll do our best to add it! You can also add any non-charity organisations you are associated with – just get in touch and we’ll update the ‘I’m proud to belong to…’ section of your profile! As a reviewer on Euan’s Guide, you might write about your experiences of access as a wheelchair user, or perhaps as a visually impaired person, carer or friend. Sharing your accessibility requirements is entirely optional, but it can make your reviews more meaningful to people with similar access requirements. This is one of the newest Euan’s Guide features, and it’s a space for you to share a little bit more of your personality on your profile! Love going on hikes? Share a few of your favourite pictures! You can post anything that shows a little about you, whether it’s adventuring with your assistance dog, baking a cake, taking part in Disabled Access Day, or photos from your favourite reviews! You can add up to six photos to your profile under ‘Your Gallery’. 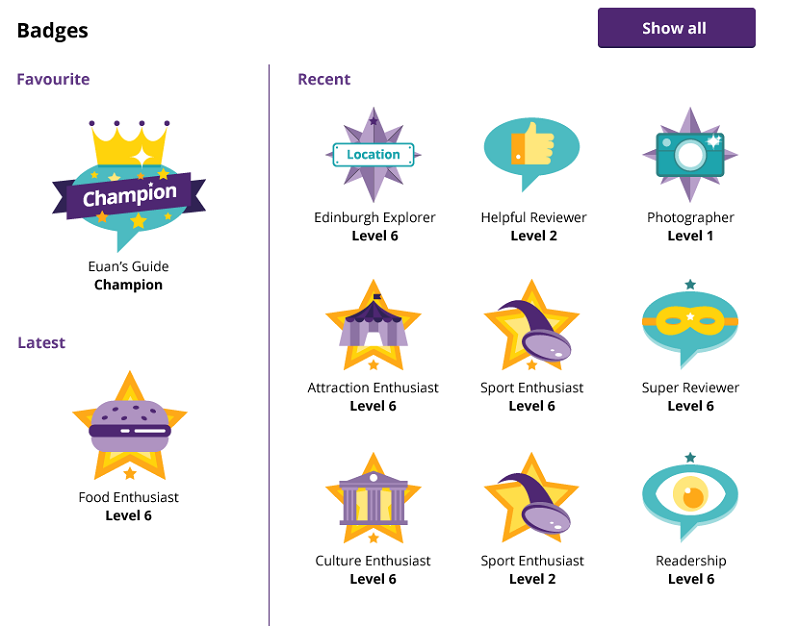 As you write reviews and use Euan’s Guide, you’ll start collecting more badges. There are lots to find, and you can pick your favourite to show off beside every review you write. To choose your favourite, click ‘Show all’ beside the badges on your profile. You will then see a button which says ‘Change favourite’, and clicking on this will let you choose from all the badges you’ve unlocked so far! If you are unsure about any of the new profile features, we’d love to help! Send us an email at hello@euansguide.com or give us a call on 0131 5105106.